When I got there, though, the day-of-game-tickets windows were closed and I found out there was only one student ticket left. 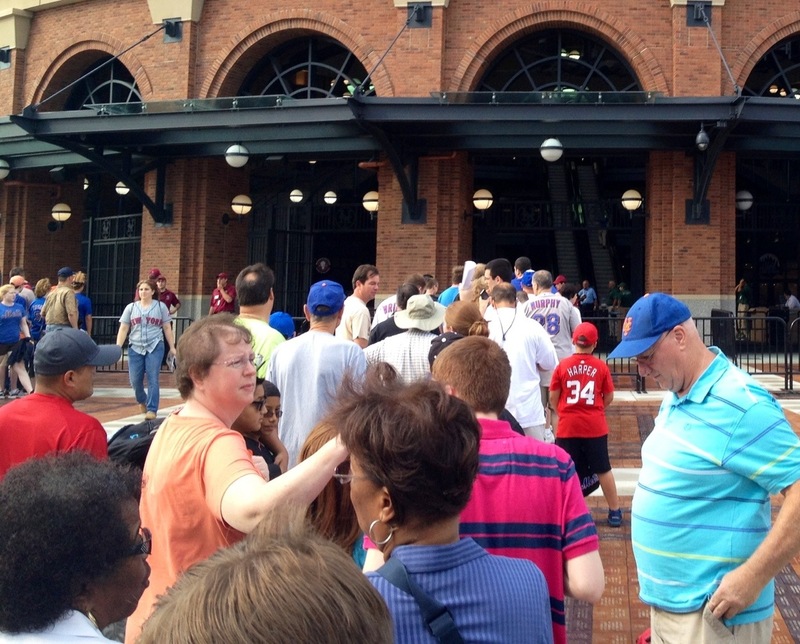 The windows were going to open at 5:00 (ten minutes before the gates), so I either going to get that last ticket or go home. 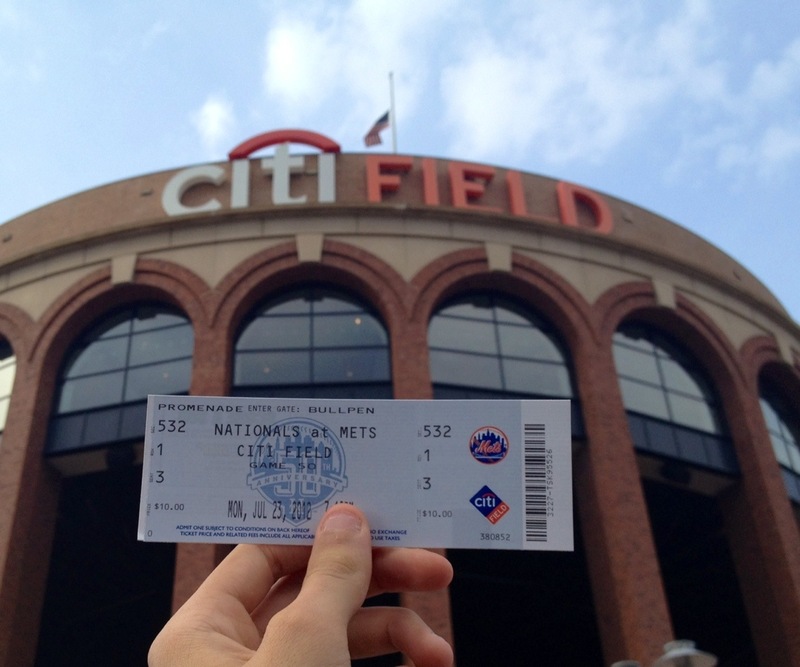 Would I get the last ticket and get to go in, just decide to splurge on a more expensive ticket, or would I get locked out of the stadium and have to wander around and take pictures like this game? While you wonder, I’ll inject this anecdote to build suspense for the answer [insert childish giggle here]. While I was waiting for the windows open, a guy approached me and said “Hi”. This guy was Chris Hernandez, a fairly new ballhawk, who those of you who read the comments may know better as “ch1088”. If you would like to read it, he already posted his entry of this game. 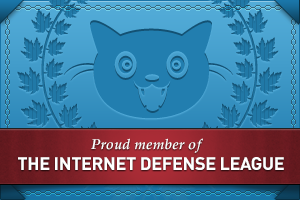 The link to which is hiagh. His girlfriend and a friend of hers were with him, so those two held a spot for both of us. Do you know how car sickness works? Basically, your brain gets confused because your eyes tell you you’re moving, but you yourself aren’t, so you get nauseous -or something along those lines. I don’t really get car sick anymore, instead I get grounds crew sick. Instead I get nauseous when I see sun and feel warmth, but there is a tarp on the field. Long story short: I got rejected by every one of the Nationals pitchers. 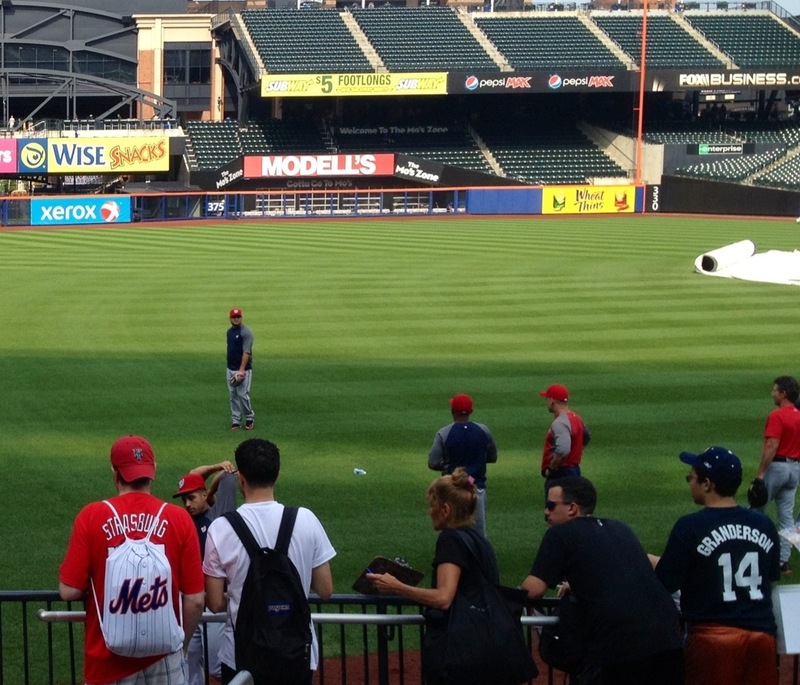 Actually, I even got rejected by the position players that came out to throw. 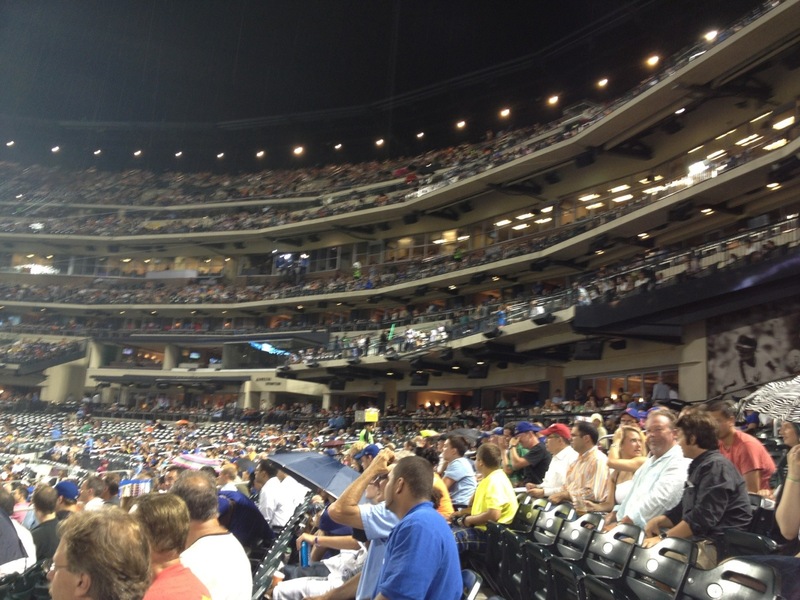 I’d estimate that fifteen balls were thrown in the stands by the Nationals. By the way, I’m not complaining, just reporting what happened. There were a ton of balls that left the hands of Nationals and fell into the stands, and I was having some bad luck considering there weren’t that many fans and I was one of the few with Nationals gear. 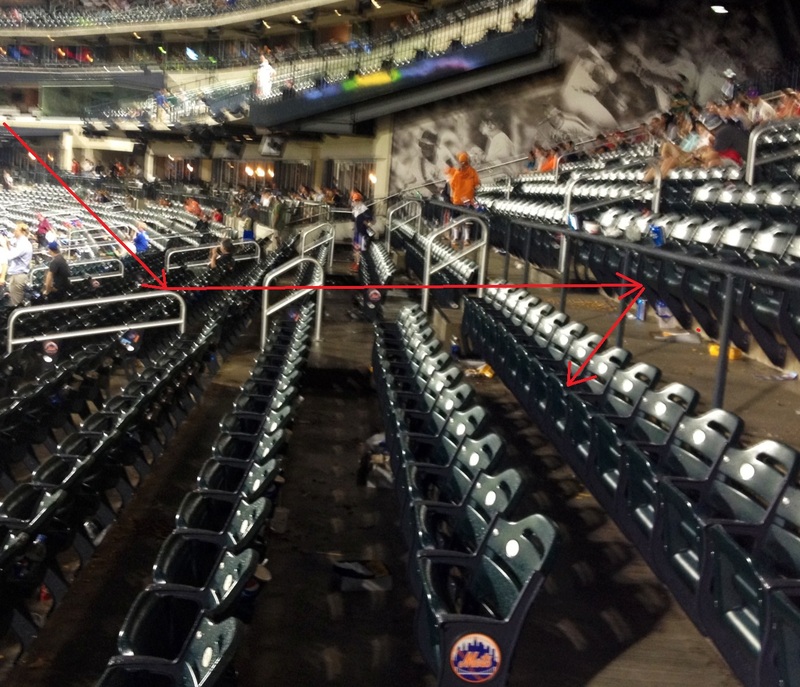 The horizontal arrow starts from where the guy was standing and ends where I was standing when he threw the ball. The vertical arrow points to the kid I gave the ball away to right after I caught the ball. 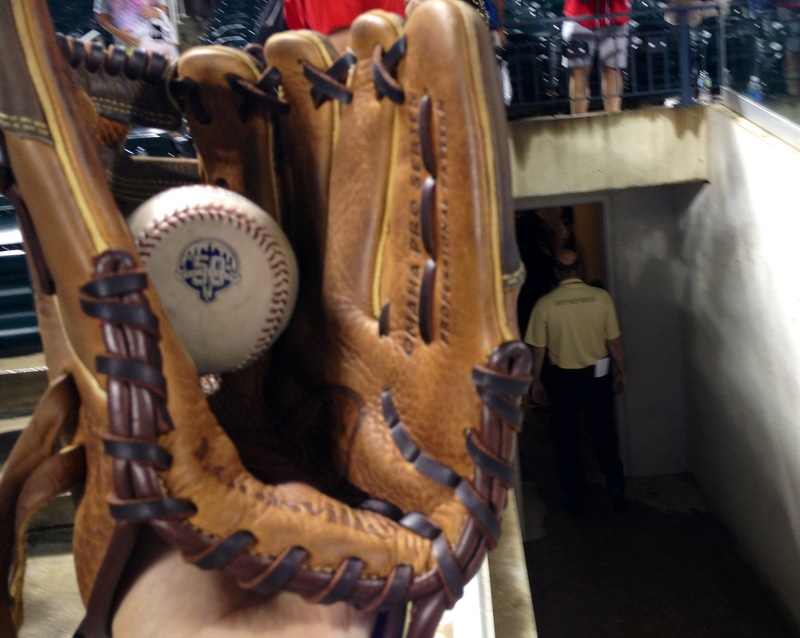 It was a perfectly good ball, but I was in essence making a sacrifice to the baseball gods for not shutting me out. Don’t you just love my religion? All of same practices and rationale but no dying is involved. 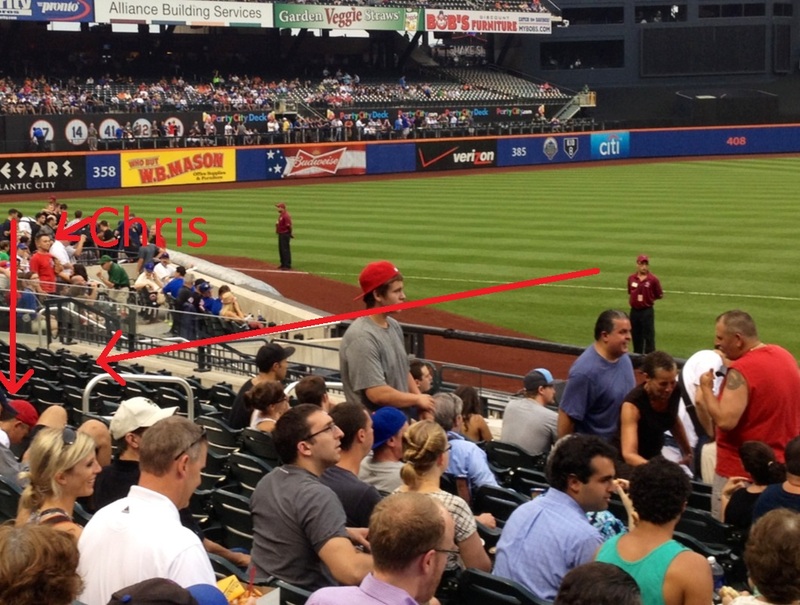 Also, you can see Chris at the far left of the picture. He’s the one standing up in the red. 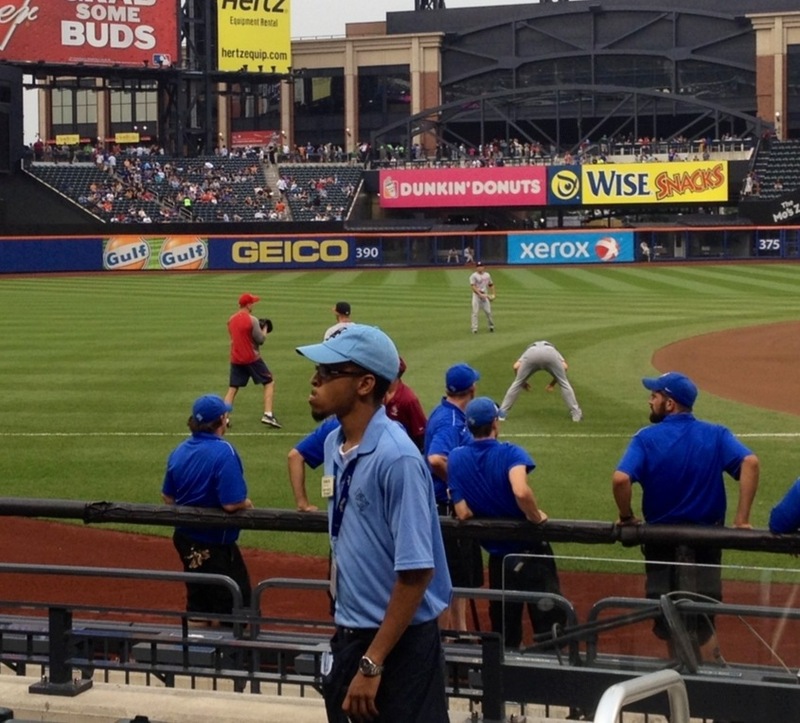 The reason being, he was trying to get a ball from the Nationals dugout. He was constantly coaxing them into throwing him a ball, but got dissed each time. 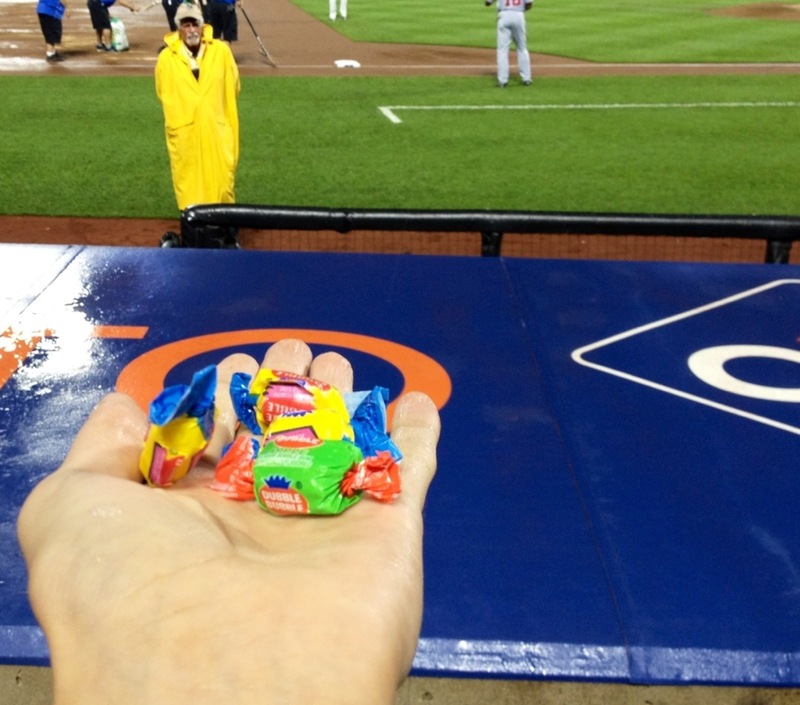 Ian Desmond was throwing gum into the stands, so I used my Nationals gear to get a piece. 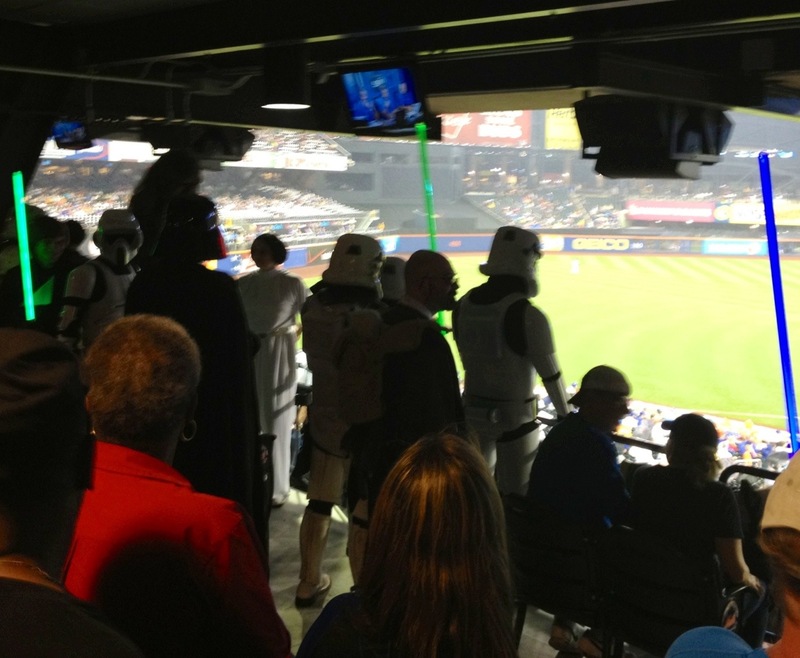 Apparently, it was Star Wars night. Whatever that means. I’m actually kind of disappointed. I wonder if that means fans could dress up. It looked like it was only special people that were dressed up. By the time I saw the Star Wars people in the concourse, it had already been raining for a while. I liked it. 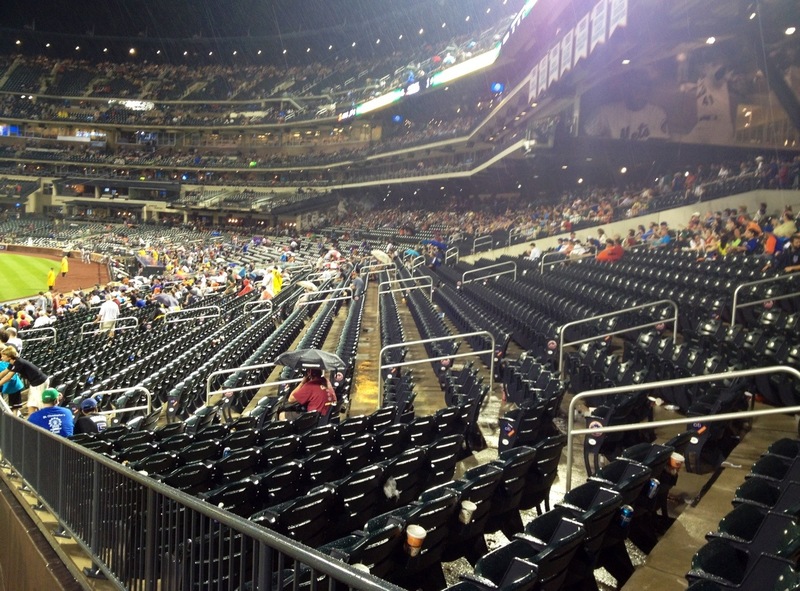 When it rains, less people are in the stands. That’s just one example, but you can read a lot more reasons to attend a game where there is rain in my most recent mygameballs.com column, The Rainy Day Gambit. 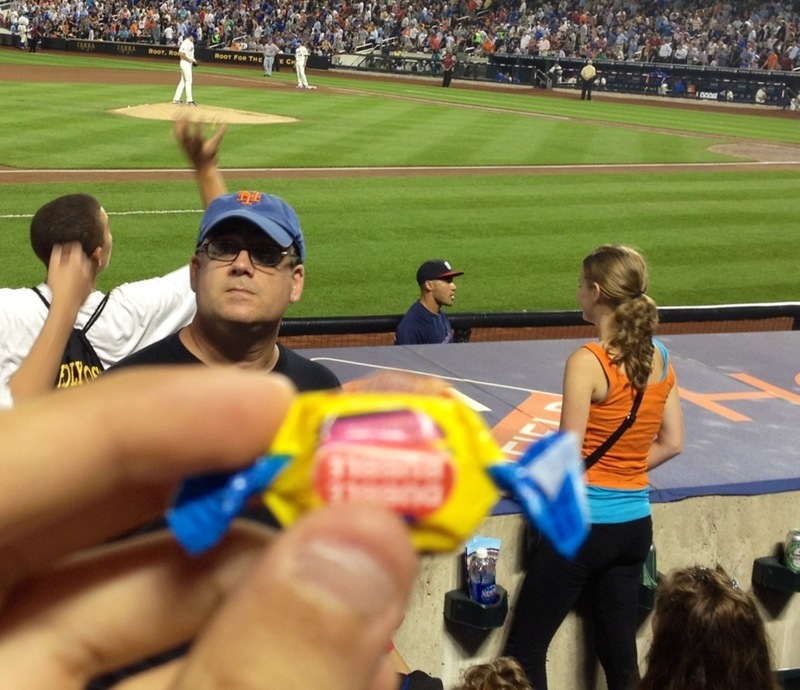 I should note the guard in the background was smiling at the fact I was taking pictures of gum. 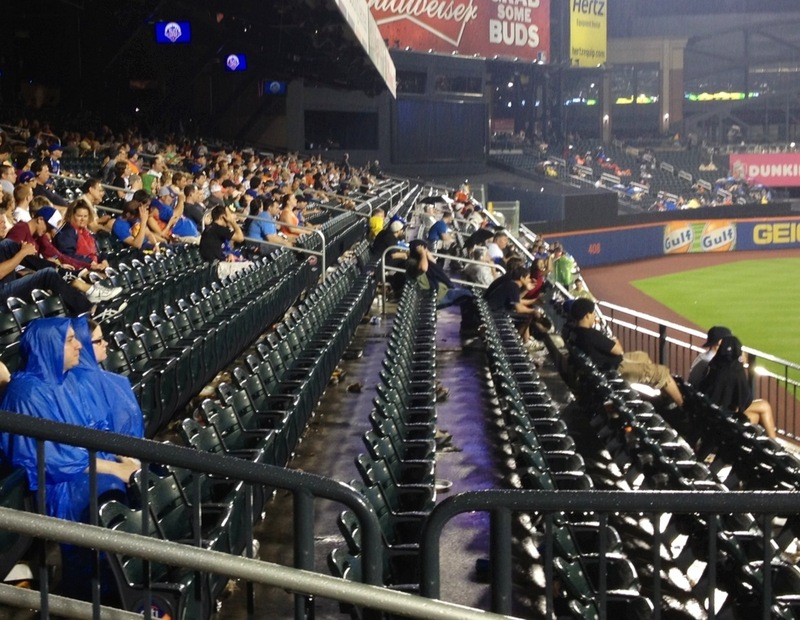 Even though the Mets are a sub-.500 team, the left field seats always seemed to be packed, so take my word for it that it’s pretty empty in that picture, in the spot that’s exposed to rain anyway. 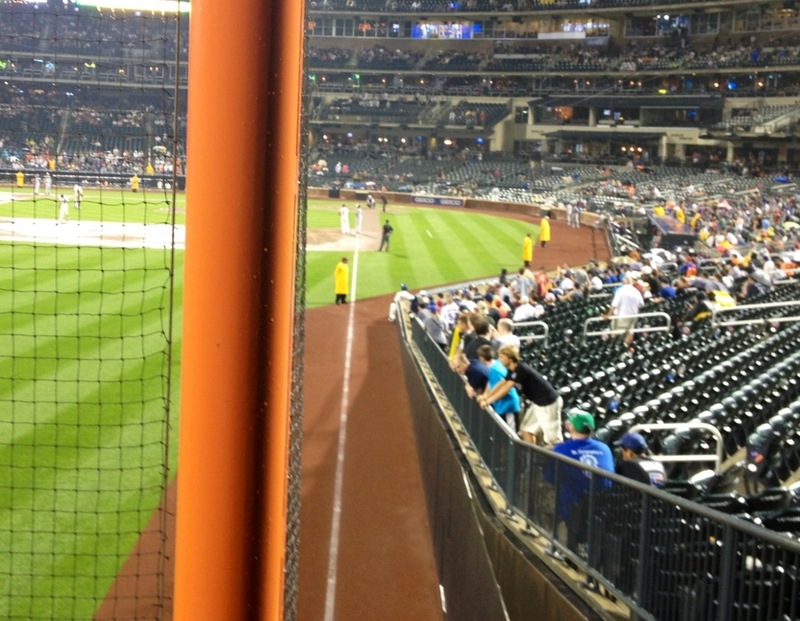 I just wanted to take a picture right down the line…so there. 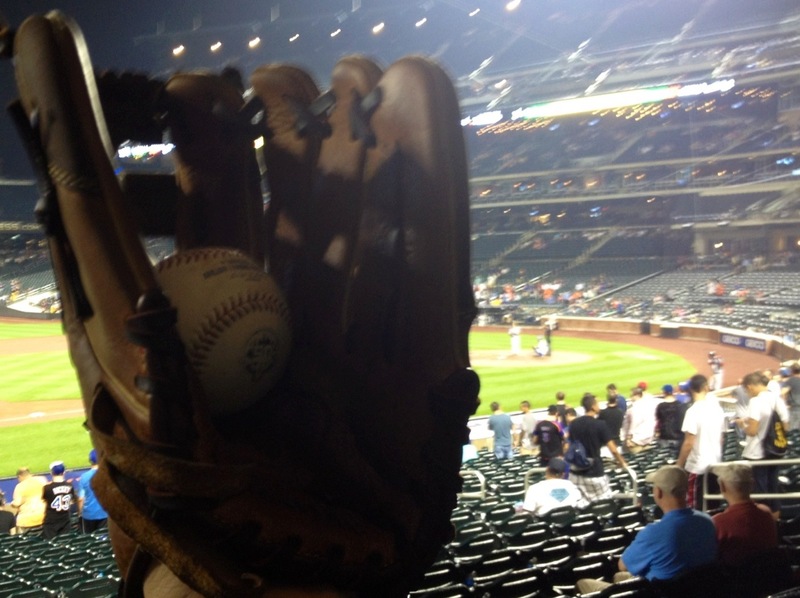 It was fun, and just like that, I had my first hit “game” ball of the year. At the umpire tunnel, I ran into Mark McConville, who you may remember from me mentioning a few times in entries last month. We really hadn’t said hi to each other yet, so we walked out of the stadium after none of the Nationals pitchers (the ones that were left anyway) didn’t toss any balls into the crowd. ok, just let me know what you decide a few days before hand. Paul- Will do. My schedule *should* be coming soonish. Mateo – Do you know for sure if you are going to be at Target Field on the 29th? If you are then i would think about going to the game and meeting you. Paul- Nope. I’d say the more likely date is the 28th, because I just put down one game from the Mariners series even though I didn’t know which I’d be able to attend. In the end, though, it all depends on welcome week schedule. 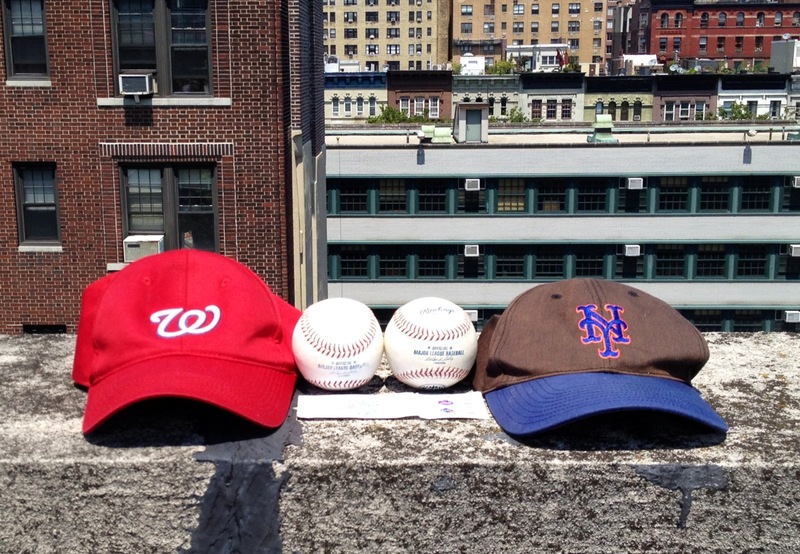 Sounds like the Mets finally got a bit more generous with the commemoratives. Cound you give me a link to your schedule? Your religion? Why not, there’s a lot of that religion in the pages of MLBlogs 🙂 : “I’ve tried them all, I really have. 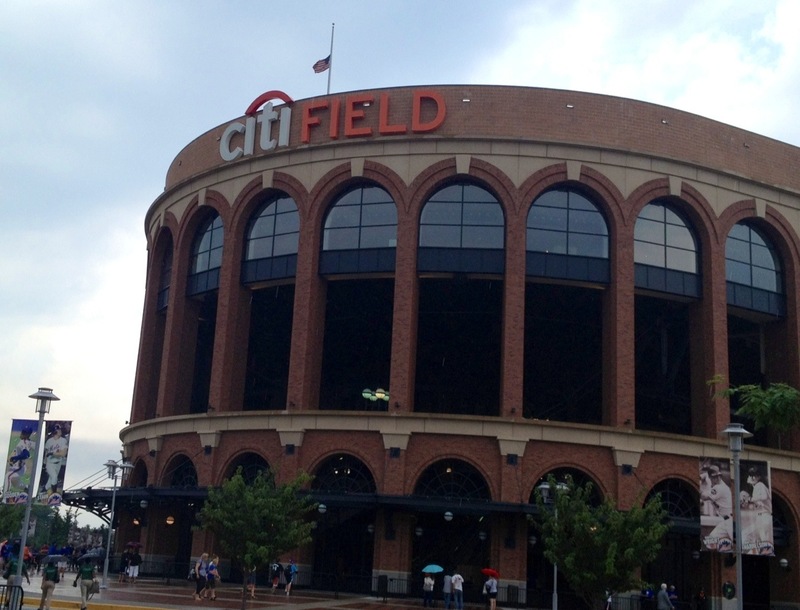 And, the only church that feeds the soul, day in, day out, is the church of baseball.” Sounds like you had a great time and pretty good luck in the end. Kristen- Ha, I never thought about that way but you’re right. Actually, what I didn’t include in the entry is how bipolar this game made me felt. 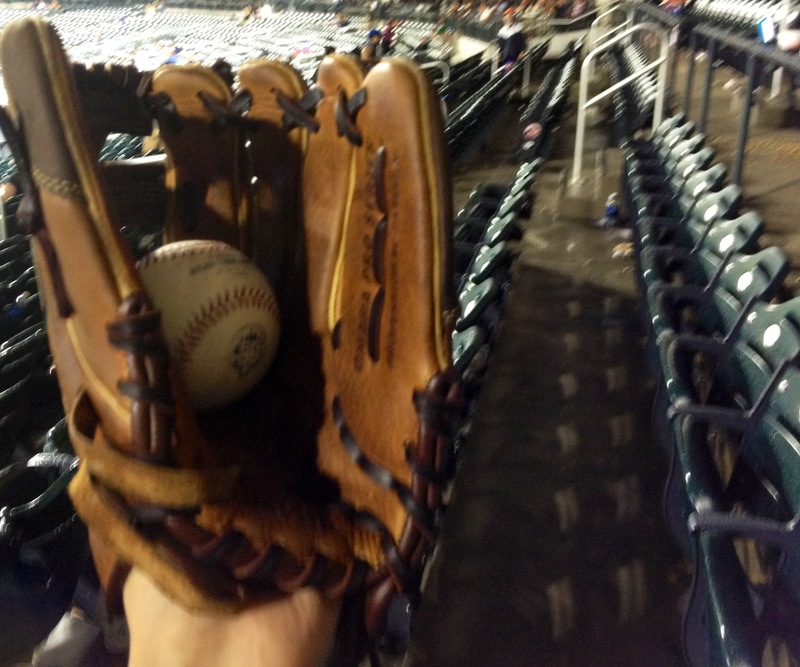 Up until I got the first ball I got, I was thinking, “Wow, this wasn’t even worth the $10 I paid for my ticket. Why did I even come to this game? I should have just left when I had the chance. 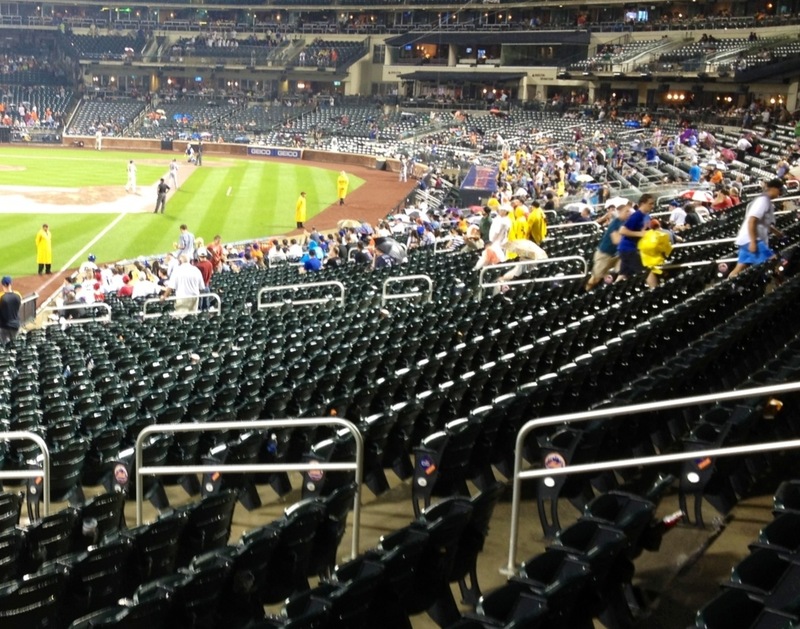 Dang you Mets grounds crew, and Nationals pitchers.” Then after the game, I was thinking, “Why can’t every game be like that? That was amazing. 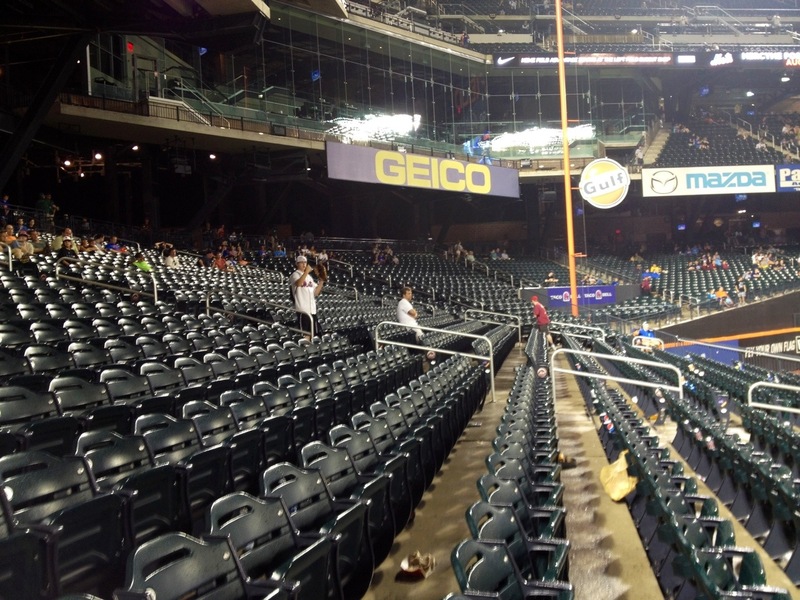 I should come to Citi Field more often. I may even come back tommorrow. Whoooo! What a game!